We decided Friday to make a run for the border. (Missouri border that is,) so we headed up to Branson. We hadn't been there in years and thought we'd give it another chance. I found a free room at this place everyone said was great with kids The Castle Rock Resort and Hotel. After they played a bit we drove around looking for things that were open (it's the off-season in Branson so not much was open.) 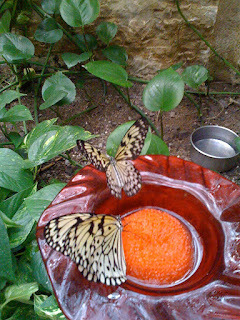 We toured the Butterfly Palace. A bit expensive for my tastes- I'd been in better butterfly habitats that weren't so pricey. Then we found a new open-air mall down on the river called Branson Landing where the Bass Pro Shop was. We ate at an awful restaurant somehow connected with Bass Pro called The Fish House (I think.) Yuck. Downtown Branson has really changed since we were there about 4 years ago to ride Thomas the Tank Engine! This morning we woke up and hit the town. Today we got up and hit the town. Next, we did the Titanic Museum. Yes, pretty depressing, but the kids seemed to like touching the cold water and "iceberg." Very interesting to say the least. Then we headed back to Branson Landing to some place the kids really wanted to go, Ridemakerz, where they build their own car (think Build-A-Bear for boys.) I normally don't fall for that corporate junk but the kids are really happy with their dumb cars. All in all it was a fun, cheesy trip, but I think I've had enough of Branson for another ten years or so. It looks like it would be a ton of fun! The water park would make it for the kids! Your kids are so cute. And this sounds like fun. Love the indoor water park and the honesty about the restuarant. When I was little we used to go to Branson every single summer. It was not what it is now at all. It was 2 lane roads and everything was spaced out. Now it's like going to Vegas! Thanks for stopping by my SITS day! You know, I've never once been to Branson? Some people just LOVE it and others don't want to ever go back. I'm disappointed to hear the news about The Fish House...I'd been wondering if it was a good place to eat. I love catfish! Dropping by from SITS to say, "hello". Best wishes. Not everyone gets to see the world's largest ball of twine.